The works by twenty-three artists range from the representational to the abstract and encompass a variety of media including site and sound installations, painting, sculpture, video, and even iPhone photography. 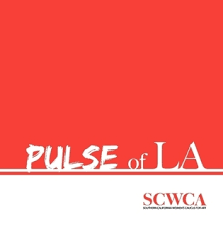 “Pulse of LA” is part of an ongoing contemporary art initiative by the Southern California Women’s Caucus for Art that includes exhibitions, programs and public conversations. A full color catalogue will accompany the exhibition. Participating artists: Julianna Balogh, Lili Bernard, April Bey, Ching Ching Cheng, L. Aviva Diamond, Merrilyn Duzy, Simone Gad, Shelley Gazin, Morgan Green, Shannon Keller, Denice Killian, Olga Lah, Emily Maddigan, Ana Medina, Susan Melly, Margaret Noble, Ellen November, Michelle Rozic, Cintia Alejandra Segovia, Lidia Shaddow, Kendra Spear, Linda Vallejo and Emily Wiseman. Hours: Wednesday through Sunday, 12 to 5 pm. The SOUTHERN CALIFORNIA WOMEN’S CAUCUS FOR ART (SCWCA) is one of 23 chapters of the Women’s Caucus for Art, the leading national organization for women actively engaged in the visual arts professions and an affiliated society of the College Art Association. Founded in 1976, SCWCA provides programs, workshops, exhibitions and recognition opportunities to women arts professionals. LESLIE COZZI is a curatorial associate at the Hammer Museum’s Grunwald Center for Graphic Arts. Her areas of expertise include Feminist art, contemporary Italian art and works on paper. She is currently working with Connie Butler on a retrospective of Italian artist Marisa Merz that will open in 2016 at the Hammer Museum in Los Angeles.